The fuselage of Aloha Airlines Flight 243 after suffering explosive decompression over Hawaii. 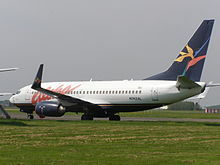 On April 28, 1988, Aloha Airlines Flight 243 was a scheduled Boeing 737–297 flight between Hilo and Honolulu in Hawaii. The aircraft suffered extensive damage after an explosive decompression in flight, but was able to land safely at Kahului Airport on Maui. A senior flight attendant, Clarabelle Lansing, was the sole fatality when she was blown out of the airplane, but 65 passengers and the rest of the crew were injured. The safe landing of the aircraft with such a major loss of integrity was unprecedented and remains unsurpassed. Subsequent investigations concluded that the accident was caused by metal fatigue. The 1990 made-for-television film Miracle Landing is based on this accident. Young, Branden (July–August 2006). "Aloha Airlines: Ready to Protect Their Beachfront in Paradise". Airliners: The World's Aviation Magazine. Airliners Publications. pp. 35–39.